The later make this plan, however, more monthly effort need be increased. About to start making applications in savings at age 30 will only be able to achieve the goal of 60 million to applying a monthly amount of R $ 2,309. 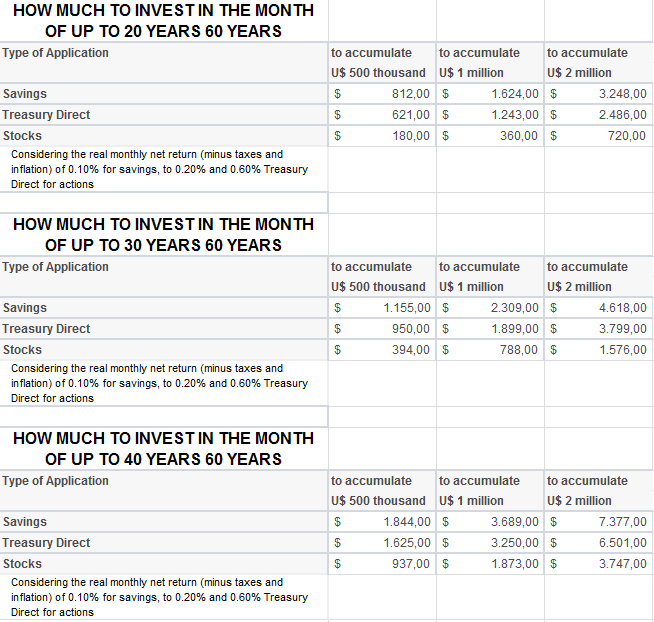 For those who begin to think about the 50, you must deposit U.S. $ 7,847 in the account each month. “The mark of US $ 1 million is a symbolic challenge because this is a sum that most people never possess as a financial reserve,” said Mark Sylvester. Still thinking about retirement, Silvestre believes it is better to invest in pension plans than in applications with high liquidity, such as savings (allowing the looting of values at any time). To make the calculations, the economist considered an actual net profit, minus taxes, fees and inflation of 0.10% for savings accounts. This return is similar, he says, that achieved in a conservative pension plan (whose portfolio contains less than 10% of investments in shares). For applications in Treasury Direct, was considered a real net return of 0.20% per month (also recorded by private pension plans, moderate risk, with somewhere between 10% and 20% of stocks in the portfolio) and for the actions, a yield of 0.60% per month. In this case, he considered a forecast for shares of major companies, pension plans or higher risk (up to 49% of stocks in the portfolio).